Let's talk about salmon. It's probably one of the most popular fish in America right now, and for good reason. These fish get a lot of hype for all their omega 3 fatty acids and people love that there are so many species with varying oiliness and flavor profiles to choose from. Just like there are wine snobs and oyster snobs, I am beginning to notice the presence salmon snobs. I have to admit, I'm not immune to salmon snobbishness myself. I may never enjoy a sale on Chilean salmon again. Despite the unbeatable price of $5.98 a pound, I'll always turn up my nose and opt for a naturally raised or wild caught fish. But at least I'm an education snob, I tell myself. Customers who expect wild caught salmon options year round need to do some research. Customers who are personally offended when someone tries to explain to them that it is ecologically impossible to have the same selection in January as in June need to shop somewhere where I don't work. Customers who won't even consider anything farmed (even an organic or naturally raised fish) despite the fact that wild salmon populations are rapidly declining, need to reevaluate why they prefer wild salmon in the first place. It's probably because they read some under-researched article online that didn't even mention organic and naturally raised options. I'm sure they're ignoring the fact that whatever chemicals they oppose being fed to the fish is being injected into the cows, chicken, and pork they've never thought twice about eating. So here's my suggestion. Buy Scottish Salmon. It's really oily so you hardly have to use any additional cooking fat. It's a naturally raised fish so you don't have to worry about mystery chemicals. It's farmed so the wild population isn't effected and occurrences of parasites and mercury levels in the product are lower. Most importantly, it tastes really good. Anyway, no matter what variety of salmon you use (or variety of protein for that matter- this marinade would be great on swordfish or even chicken if you're into that) this recipe will give it some good flavor. Just a teaspoon of molasses is all it takes to add a hint of sweet and encourage a nice caramelized crust. This meal has got a nice cohesive Mediterranean theme (save for the salmon itself which is vacationing from Scotland) so it would make for a good impress-the-visiting-relatives meal. Grind sun-dried tomatoes into a paste with a mortar and pestol. Whisk together with molasses, tomato paste and vinegar. Evenly coat all surfaces of salmon filet with the marninade and let rest for at least an hour. Lightly steam brussels sprouts, garlic and onion until tender and fragrant but not mushy. Add Feta and seasonings and toss to combine. In a lightly greased pan over medium heat (or on the grill) sear the marinaded salmon for 5 minutes on each side or until almost opaque throughout and lightly caremelized on the outside. Your goal center temperature is almost 140 degrees but higher quality salmon can be safely consumed at more rare temperatures depending on your preference. Remember that salmon, like most seafood, will continue to cook slightly once removed from the heat so be careful not to overdo it. 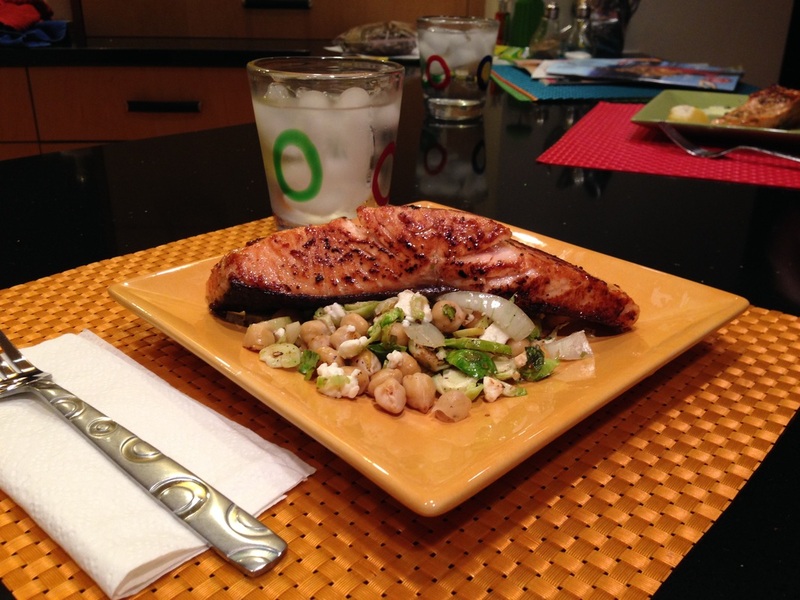 Serve the salmon filet over the warm salad and enjoy.